After reading Nijkamp's debut, I'll admit that I was a little skeptical about this book. While I thought that one had a good premise, the story itself didn't completely wow me. I was, however, willing to give her another shot, and I am so glad that I did. I'm back with another book review, Before I Let Go by Marieke Nijkamp. Thanks so much to Sourcebooks for sending me an eARC of this book for an honest review. As always, all opinions are my own. The story follows Corey, a girl who after moving away from her best friend, Kyra, and small, traditional town in Alaska, returns after Kyra's suicide. When Corey arrives, she is faced with a completely different town than the one she left. The people mourn Kyra as one of their own when Corey knows that they shunned her after Kyra's bipolar diagnosis. They begin to claim her death was meant to be and push Corey away as an outsider. As Corey delves deeper into the last few months of Kyra's life, she begins to realize that what happened to her friend may be much more sinister than she originally thought. I really didn't know too much about this book going in. In fact, I thought it was going to be a thriller. It ended up being a raw and gut-wrenching portrayal of mental illness and how people cope and see mental illnesses. 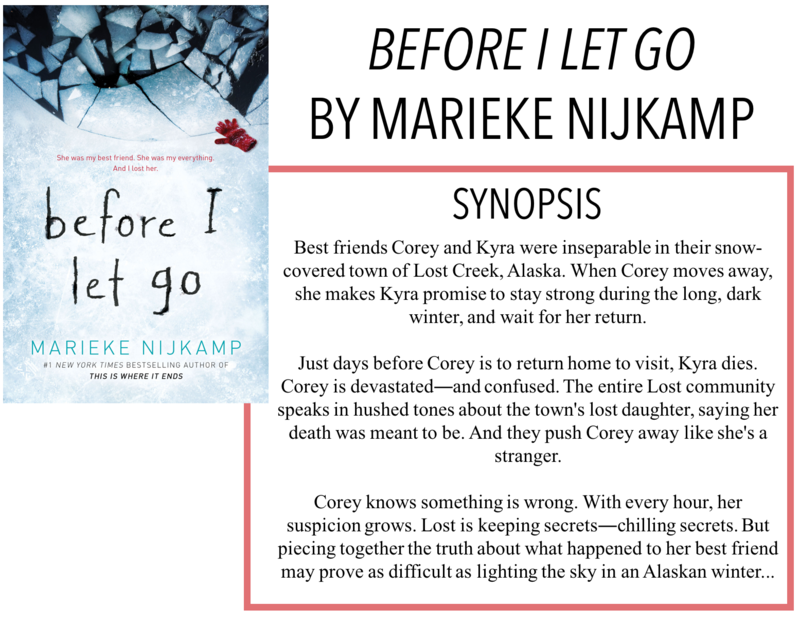 I don't want to give too much away because it would spoil the story, but Nijkamp's depiction of the town's reaction to Kyra's bipolar disorder is both devastating and a horrific example of perceptions of mental illness. They exploited her illness for their own gain and could care less about how it was affecting Kyra's mental health. I've only read a handful of books about bipolar disorder and they've always involved the main character as having the illness. This book shows the disease from an outsider standpoint, both with the town and with Corey. I thought that was a really interesting way to look at what happens after the diagnosis; how people are treated differently afterwards, even though they are still the same person. Nijkamp does a great job of shining a light on this not-often discussed topic. This book also shows diversity with portrayals of many sexual orientations in the LGBT+ spectrum. Corey identifies as asexual, Kyra pansexual and the book also includes a m/m romance with one of the girls' friends, Sam. While most of the book is spent looking at Kyra's life and illness, there are a few snippets where their sexual orientations come into play. Nijkamp includes these details in the story as parts of the character, not merely as plot points. At the same time, while the diversity is acknowledged, Nijkamp doesn't make it the sole focus of the novel. The pacing, writing style, and overall length of this novel really helped keep me engaged while I was reading. I ended up reading it in one sitting - the chapters were short and the story was interesting. I'm not sure I would have gotten through it as quickly and liked it as much as I did if these aspects weren't where they are. Despite all these good qualities, I often found myself wondering what was happening and when the big climactic scene was going to come around. When it finally did, it felt a little bit off to me. We went from everything being kind of weird and strange to a full-on murder attack. Not at all what I was expecting and it just felt a little odd to me. I know Nijkamp is a figure in the We Need Diverse Books organization and I was quite happy to see her thanking her sensitivity readers in the acknowledgements section at the end of the book. Sensitivity readers are, in my opinion, crucial in accurately portraying sensitive and difficult topics, and I was glad to see Nijkamp used them in this novel. Overall, there were definitely parts of this book that I liked, but there were also parts that didn't make a ton of sense to me.